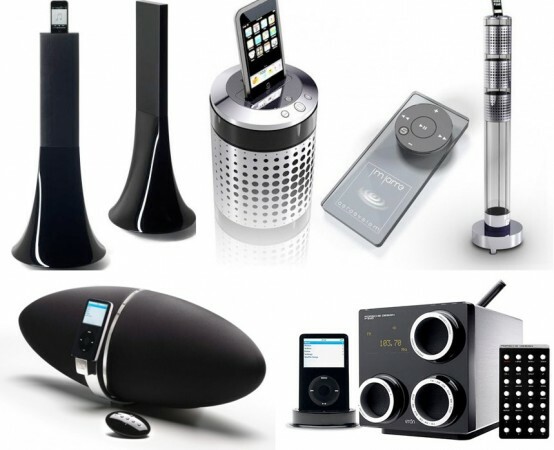 With all these gadgets, Apple lovers must be over the moon! iPods are the most popular players in the world at the moment. iPhones are too aim to become as popular in mobile phones world as iPods in players world. Thanks to that a lot of design companies create accompanying products for them. 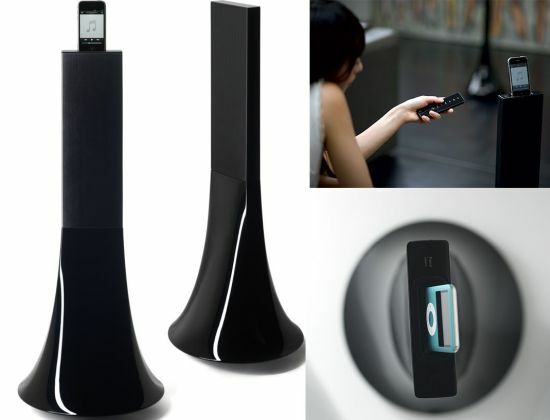 Designing an iPod dock become a “must to do” for most leading companies in the industries. Of course small companies aren’t stay aside because for some of them that is the way to declare itself. At the moment you can find in stores docks made by such famous names: Sony, Porsche Design, Lasonic, Jean-Michel Jarre and so on. Although guys like Philippe Starck or Victor Vetterlein easily can compete with them. Most of modern docks are suitable for both iPods and iPhones and have remote controls. Some of them have video outputs while other have wireless speakers. There are plenty of good choices for every Apple lover. Vestalife‘s new docks are designed by California design company, RKS. The Firefly and Jewelbox speaker systems aren’t your usual iPod docks. They both are touch sensitive and round-shaped. To reveal dock and speakers balls should be opened. These iPhone and iPod compatible docks has much to offer in a little package. They have built-in subwoofers, amplifiers and remote controls. Sang-Hoon Lee designed this multifunctional unit, which could become great addition to every bedroom. 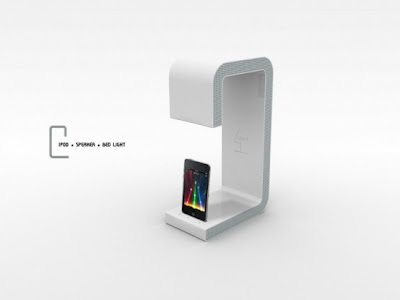 It combines a bedroom light, iPod/iPhone dock and speaker. The speaker is hidden along the surface of the dock. The combination of functions is great not only for bedroom but for office or any other place where aren’t a lot of space but music and light are needed. 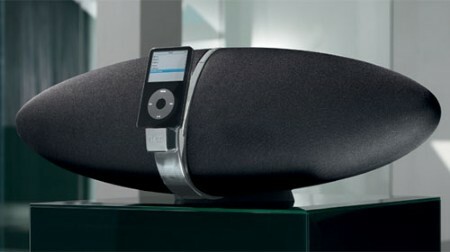 IDEA 2008 winner, Bowers & Wilkins’ Zeppelin designed by Native, is the unique, eye-grabbing designed dock for iPod. The dock has not only great design but also a lot of functions under the hood. A cradle supports all recent iPods (charging all but the 3rd-generation models). Zeppelin has a remote control, an auxiliary-input audio jack and composite/S-video output jacks for viewing video and photos from your iPod, on your TV. The Porsche Design P’9120 is a table top stereo system with iPod dock and radio. 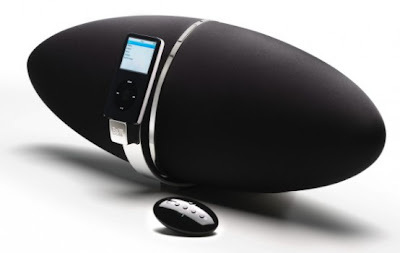 It has a clean, linear shaped design with superior acoustics and powerful subwoofer. It recharge any iPod and iPhone but haven’t any wi-fi connectivity so can’t be used as network player. 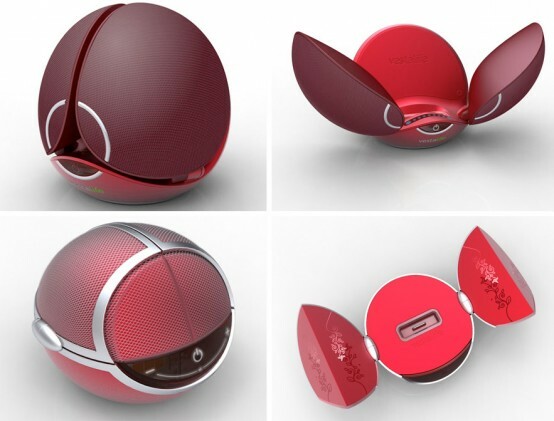 Electronic music pioneer Jean-Michel Jarre designed an odd looking iPod speakers which looks as 1980s as futuristic. 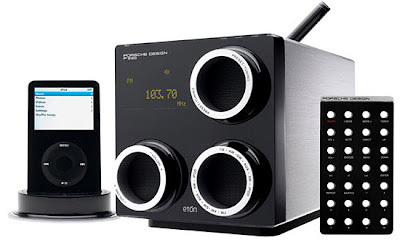 It packs two 20W speakers and a 45W subwoofer and comes with an iPod inspired looking remote. It’s aimed at the top-end of the dock market, since it’s specifically designed to deliver high-quality audio: the circuitry in its integrated amp is apparently clever enough to add back some of the quality that’s missed by MP3 encoding. iTam Tam looks nothing like other iPod docks. Designed by Eric Berthès from Branex Design, the dock looks like traditional tam tam stools. 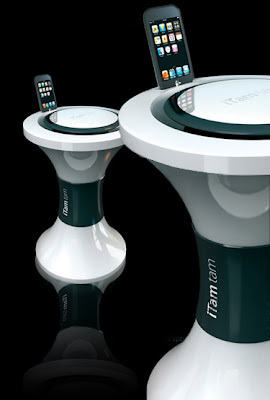 iTamTam is universal docking for all iPod models and iPhone and also its cord adapter allows any type of audio source including MP3 player from other brands. It has 2 x 25 W stereo and speaker with 50W digital amplifier technology and a remote control. 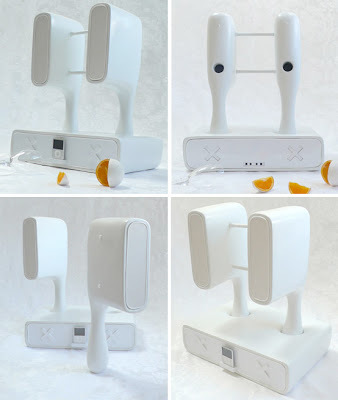 Designed by David Weiner Ventures, Art.Suono allows you to transmit any audio source, including an iPod, using an integrated dock connector, to any audio system. The Art.Suono also features “DWC-APHEX” circuitry which restores harmonics lost in compressed music, according to the developer. The result is improved spaciousness and clarity of sound and more resonant bass response. The Sony Muteki LBT-ZX66i is a 3-way Bass Reflex shelf-system/boom-box outfitted with four 6.7” hybrid mid-range/subwoofer units and dual 1” horn tweeters that output a total of 560w of power. 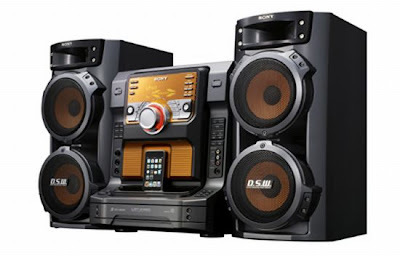 Besides iPod dock it sports a 5-disc CD changer with Play Exchange and CD-R/CD-RW & MP3 playback and radio system. It’s blast from the past with every up-to-date feature. 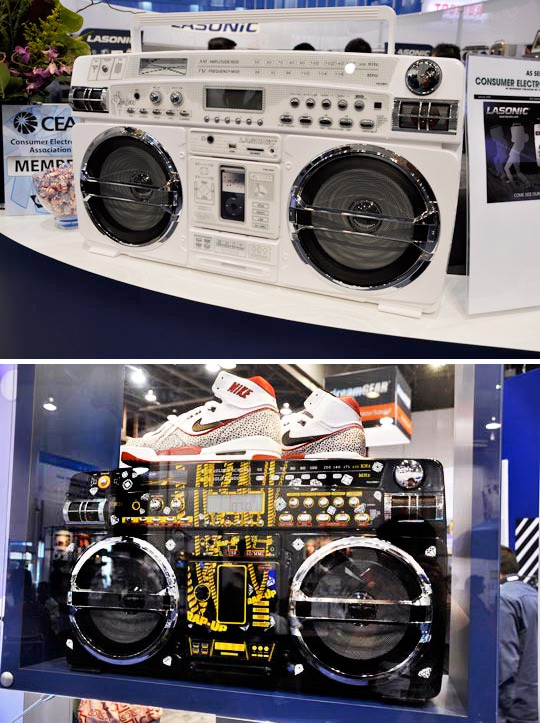 Lasonic made some classic boomboxes during the 80s, and now they’ve updated their TRC-931 boombox with a built-in iPod dock, SD card reader and USB port. It comes in different colors and could work from 10 batteries. 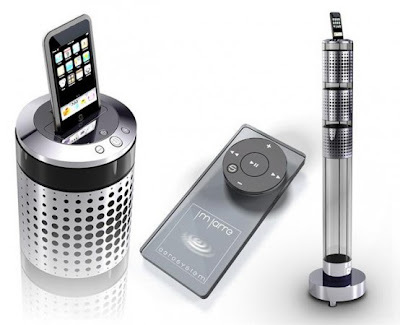 American designer Victor Vetterlein decided that our iPod docks needed to have wireless speakers, speakers that could be detached from the dock and roam around apartments. 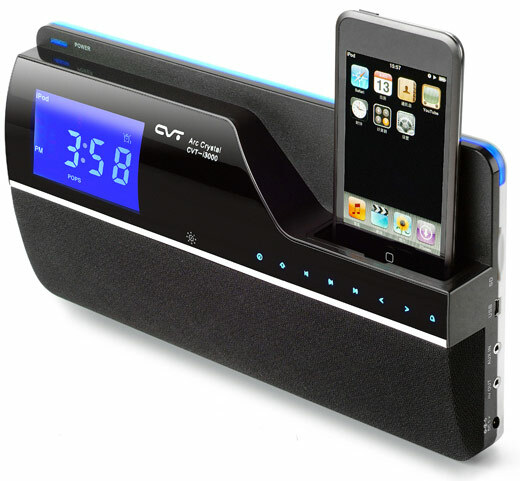 Yo dock is designed for iPods and other MP3 players. The speakers are waterproof and have rechargeable batteries inside. A collaboration between Michael Young and EOps, the i24R3 wireless speaker system works with satellite speakers and a bass dock. The set is made from pure white gloss and includes an aluminum casing. The system includes a wireless USB audio transmitter dongle that allows you to even stream music from your computer via iTunes. This allows you to control the system remotely via your computer from anywhere in the house. Naturally the dock can also be paired as an extra set of speakers for your computer. The Griffin Evolve is the no-wires freedom your music has been waiting for. Play your music on rechargeable wireless speakers that you can put anywhere within 150 feet. 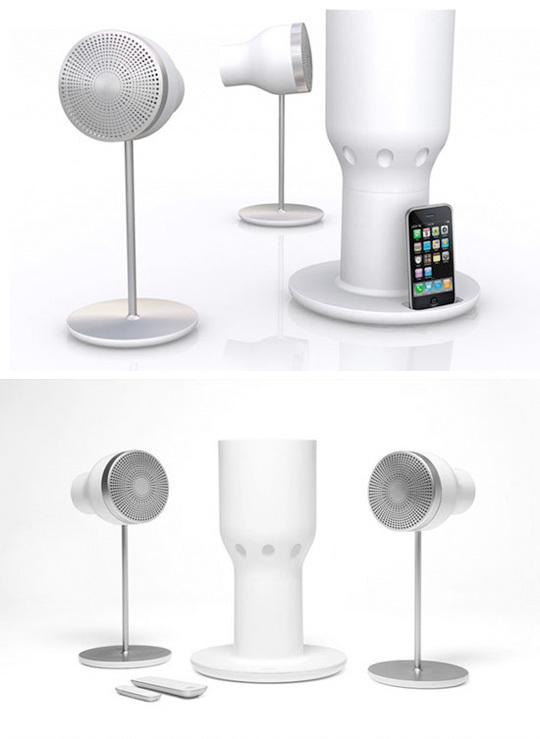 Speakers charge while they sit on the Base Unit and play for up to 10 hours on a single charge. The dock has remote control and both S-video and component video outputs. Breathe new life into your music with the Logic3 Valve80 iPod Amplifier, designed to exceed the benchmark set for iPod sound performance. High end valve processing technology will add real warmth, enriched harmonics and a new dimension to your music’s characteristics, which is priceless. Logic 3′s Valve80 includes a pair of 2-way bookshelf speakers coated in a black lacquer finish along with a swank tube amplifier that pushes out 40-watts per channel.